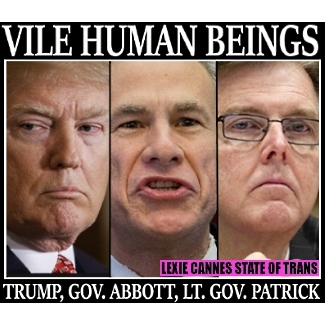 LEXIE CANNES STATE OF TRANS — The news out of Texas just moments ago that a state senate committee signed off on a trans-hate “bathroom bill” 8-1, sending the thing to the full senate for consideration wasn’t really a surprise, yet it momentarily shook me. See, I’ve been absorbing articles all week trying to pin down whether or not it was likely Robert Mueller would get fired by someone under the order of Trump before Mueller finished his investigation. The actions in Texas today reminded of something — of course Trump is going to fire Mueller, it’s what vile people do. Think about it. After a year of disparaging the New York Times – “fake news”, the “failing New York Times”, Trump turns around and gives the paper an exclusive interview to throws his own staffers under the bus! The vileness here is one for the ages. The man cares for no one that isn’t named Trump. Not named Trump? Beware of bus. In Texas, they have their own sort of vile people – Republicans Gov. Greg Abbot, Lt. Gov. Dan Patrick and state Sen. Lois Kolkhorst – folks absolutely determined to throw a log in the path of transgender people just trying to live their lives. Are you transgender in Texas? Chances are better than ever there’s a log truck about to dump a load in your path. Which bring me to my point. There are people making contingency plans and this should include us. In the case of Trump, our stepped up pressure on GOP representatives in the House become paramount and this includes a massive turnout in the streets. If we can’t force their hand, then the Democrats head to 2018 with a significant advantage – a referendum on Trump. This is a worst case scenario, too. Chances exist the GOP will step up their own investigations into Trump, but count on it? No. Which is why we take to the streets, at the very least. In Texas, we’ve seen previous attempts to stop transgender disparaging go down in flames. That said, the number of blue voters in the state of Texas is sizable — larger than the population of some entire blue states. These are numbers that can make the economic chaos inflicted on the state of North Carolina seem pale by comparison if we can engage them. Already large Texan businesses and chamber of commerce are already warning of a hundreds of million dollar economic hit should the bill became law. Engaging our allies should bump it up much further. It looks like we’re headed for a few showdowns and I’m ready. Hope you are, too. ‹ Trans actors only for trans roles? An artist’s perspective. mass mock suicide at the texas state house anybody? M2F transsexuals: either due diligence and aspire to being their utmost feminine selves and do their best to pass as genetic women, or don’t bother trying to transition at all.